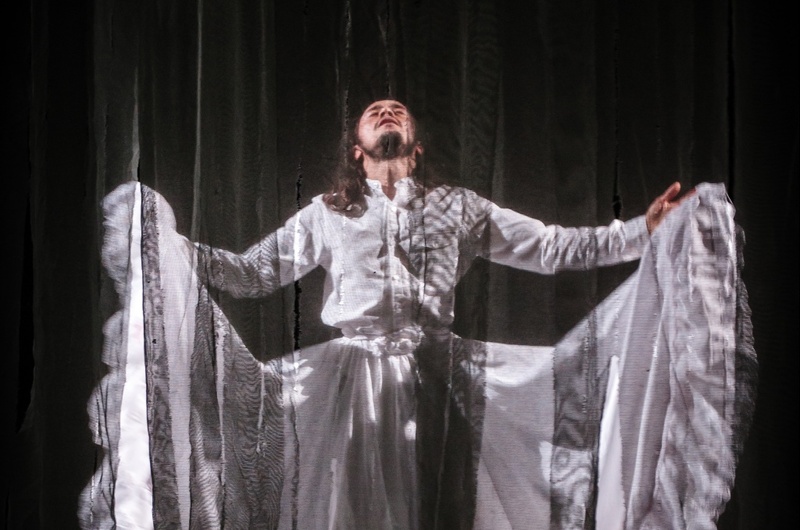 An incredible, compelling performance mixing physicality, mime, art, audio and monologue, Sophie Foggin saw Miguel Hernando Torres Umba’s Stardust at the 2017 CASA Latin American Theatre Festival. The start of Miguel Hernando Torres Umba’s Stardust is ambiguous. In a chatty conversation with the audience, he subtly introduces the play by telling us the story of the 10 years he has spent living in the UK as a Colombian immigrant. He explains how, much to everyone’s disbelief, he has never taken cocaine in his life, nor attempted to smuggle it into the country, nor sell it, nor produce it. Fed up with the stigma that the Western World associates with his nationality, Stardust is Miguel’s answer to the countless airport interrogations, snide comments, and loud, deliberate, sniffs he has been subject to over his years living away from home. The entire piece is focused around a mental battle between Miguel himself, as a Colombian man, and the devil that has developed on his shoulder during the time he has spent living in London. Should he or shouldn’t he try the line of cocaine laid out for both him and the audience to reflect on throughout the play? The coca leaf is a plant traditionally used by indigenous tribes in the Colombian Amazon in a pow-wow type gathering that would bring people together to talk. The piece opens with an enchanting mime that recounts this story, performed behind a gauze screen onto which delicate illustrations are projected, brought to life by audio narration and music. In a mixture of monologue and multi-roleing, Miguel portrays the energy of a cocaine high, breaking into electric caleño salsa around the stage at 100 miles an hour, accompanied by a step-by-step narration of the thoughts going through his head. We are then transported to the American-style game show Plata o Plomo; Miguel uses this relatable format ironically, as a metaphor to convey the destruction caused by a production line of illegal drugs. This is all put into context by the million-dollar figures which rack up at the end of each round of the show, highlighting just how lucrative the narcotics industry can be and leaving them audience wondering who benefits from these extortionate sums of money. Using a mixture of wit and sarcasm that he has so clearly picked up from the British sense of humour, Miguel exposes the hypocrisy in so-called liberalist views, mocking some of us for declaring ourselves vegans, “for the sake of animal cruelty” whilst simultaneously ignoring the endless demand for weekend party drugs. Perhaps the most hard-hitting moment, however, is the testimony of Miguel’s best friend which he delivers in an emotive and heart wrenching monologue. We learn how it was to grow up in a family connected to the most powerful man in Colombia at the time, Pablo Escobar. How she lived every day in constant fear for her own life and the life of her family. Miguel cleverly incorporates visual media snippets into a powerful attack on the hypocrisy of Western Politics. His angry crescendo of retaliation throws the ignorance of Raegan, Trump, even Noel Gallagher and the producers of Narcos into the spotlight, as he desperately questions why Colombians and Mexicans have been labelled the “bad hombres”, in a War on Drugs fuelled by Western demand, and at the cost of Latin American life. We are reminded in Stardust that the majority of these so-called “bad hombres” have fallen into the drugs trade not out of choice, but out of desperation. Often the poorest and most vulnerable communities are forced to work as producers in this illegal business or become involved because it is the only financially attractive option. They repeatedly fall victim to the extreme violence of the gangs who control the trade and operate outside of the law. As a result, countless lives have been lost. The knowledge that for every one line of cocaine, one life is lost puts things starkly into perspective. Our protagonist’s desperate frustration culminates at the end of a play, when a white powder pours over him from the ceiling that he frantically tries to wipe off, much like the stigma he has constantly been battling to shake off throughout his life. In fact, he rubs so hard that it seems almost as if he is trying to rub off his own skin, as if this stigma he has been assigned is part of his identity as a Colombian. The solution, he proposes, is a return to the indigenous use of a coca leaf. The first step is to abolish the stigma, which can only be done by bringing people together to talk. Much like the coca leaf was originally used to do. It is only then that Miguel suggests real steps can be taken to bring about change. An important and unmissable play if you want to see politically-charged theatre done well. Or, alternatively, for anyone who has ever wondered, never wondered, or never cared how this readily-available white drug ends up in our possession.